If terms, Running, Mountain, Slope, , and Joy finally suggest you A test of Stress & Suffering Running on Mountain Slopes amongst Beauty to test tenacity, strength and perseverance. Large UTBCN sporting event, part of Campionat de Catalunya ultraendurance FEEC . Good for the Ultra Trail Mont Blanc , the showpiece of Trail Running in Europe. The start will be in Plaça de la Fragata, Sitges. Then you will pass through Port d’Aiguadolç and through a part of Sitges beach to finally go up to the Mediterranean mountain. At the end you will arrive again to the Port d’Aiguadolç while enjoing the charming Sitges landscape. The UTBCN route has and 8 shape (double loop shape) and pass twice through the town of Begues. Race start will be at 7 am. The time limit to complete the UTBCN will be 24 hours. At Begues (Km 34) will be the first time limit: at 14:30 h to UTBCN runners (7:30hs after the starting time) and at 15:00 hs to HTBCN competitors (8hs since the starting time). UTBCN competitors will have another time limit in the second Begues pass(km 66) at 20:00 hs (13hs since the starting time). All those runners who arrive later than these time limits will have the option of coming back to Sitges trough a quickest route or will be taken to Sitges with car. On race day, not be changed from a discipline to another. That is, you can not go to the HTBCN UTBCN or vice versa. The change will result in the immediate disqualification of the race. At the last stretch from Begues to Sitges there will be a more time limits that will be common for both races: Can Grau (km 93) that close at 4 AM (21 hs since the starting time). All runners that arrive later than these time limits will be taken to Sitges by car. The awards ceremony will take place at 22:00 pm in the Capitanía Square of Port d’Aiguadolç. 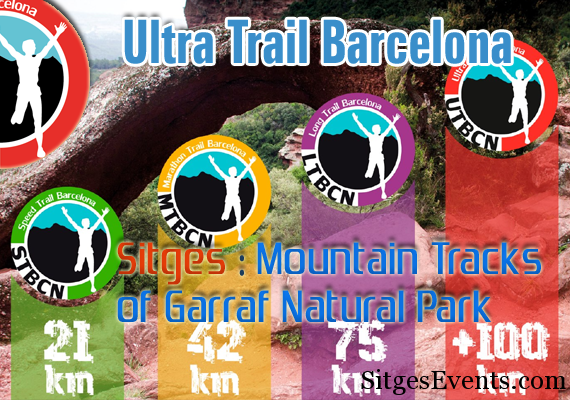 Sitges-Begues (33,5km and 1.625m D+): Thefirst stretch from Sitges to Begues is the most technical, with limestone paths and typical Parc del Garraf palmetto. The route starts at Plaça de la Fragata, and goes up to the mountain throughGR-92. GR is left behind to take the route to Creu de Sant Isidre and Puig d’en Boronet, Cami del Hito, Coll de la Guardieta, Coll Blanc where you will take PR-37 until Vallgrassa. Following this direction you will go back to GR-92 92 and this way will take you to Morella. The route then will go down to Pla del Carxol to go up again to Puig de Solius and once we arrive to Serrat Blancridge have been reached the route will continue to Pla de Bassa Llacuna. From there you will descend to Can Termens, arriving to Begues trough Can Rigol. Begues-Torrelles de Llobregat-Begues (34km and 1738m D+): The Second stretch is the one with the biggest uneven and the most leafy, going through passes and tracks surrounded by oaks and holm oaks. The stretch start going out of Begues direction to the sea to go up to the Desfeta and arriving to the emblematic Castell de l’Eranprunyà. From Bruguers toermita del Roser, you will find tracks and roads that bring us closer to Sant Climent. From the Sant Climent town we have to climb the Turó del Tabor and cross Collada Fustera with its 6 tops to Coll de Querol. You will descend to Torrelles de Llobregat where we will go trough town center to go to Coll de la Serra de can Ros and will ascend to Puig Vicenç. From there we go near Vallirana trough Bosc Gran, and before arriving we will detour to Polvorí de la Vall d’Arús to Creu d’Ardenya from where we will come back to Begues. Form Begues goes up to Puig de Saiada, following to the top of Montau and arriving to Puig de l’Antiga. From there you will descend to the right along a path to Olesa (Control and provisioning). We’ll ascend GR5 and descend to Serra de les Planes to reach the Coll d’Esteles direction to Comes, crossing below the road ofcan Mitjansand continue along riera de Pelagons until it connects with the GR 92.3. We’ll passSanta Susana, laLlaureda and we link toGR 5 that whill take us direction to can Grau (Control of time limit and provisioning), Cuatre Camins, Turo de l’Ombril , etc until we arrive to the last provisioning of Maset de Dalt. From there passing trough Creu de Sant Isidre we will reach the finish tol: Port d’Aiguadolç.